The Forest Room features a Wooded Theme throughout. A nighttime constellation of glowing stars gives one the feeling of resting in the forest. The walls are integrated with tree branches on the forest murals. A King-sized bed is featured in this room. Glass doors open onto your own private deck overlooking cascading waterfalls. A corner fireplace enhances the experience. The Birds-Nest room features hand-painted walls of vines and grasses. Tucked in corners are bird houses and nests. The Bird-house arbor enhances the Queen size bed. A nighttime constellation of the summer sky completes the coziness of the room. 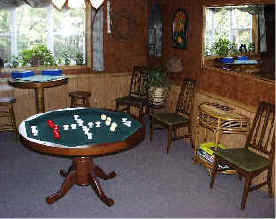 Game Room has games, bumper pool, electronic darts, cards, puzzles and novelties. The CliffSide fully stocked, modern kitchen. The doorway on the right leads you down to the waterside sitting room. The room overlooks the waterfalls and woods. Relax by the fireplace while watching for the whitetail deer that roam among the trees. CliffSide, features a living room, game room, waterside sitting room with fireplace, bath with tub/shower, washer & dryer, Wireless Internet, TV, CD player and a modern, fully stocked kitchen where you may enjoy a delightful breakfast from the fresh home-baked breads, pastries & seasonal fruits. CliffSide Cottage sits on a cliff with a walkway leading down to the cascading Old Mill Stream and a great view of the 1835 Stone Grist Mill shimmering below the Gorge. Relax in the private outdoor Hot Tub Spa located at the edge of the gorge. Sorry no smoking, young children or pets. Historical tours and Gift Certificates are available for our guests. 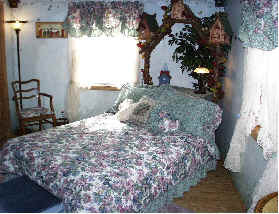 One bedroom (1 or 2 guests) - $295 + tax A NIGHT on a two night minimum stay. 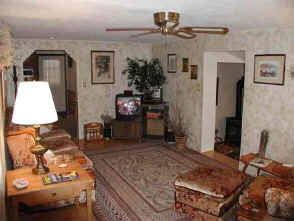 Two bedrooms (maximum four guests) - $395 + tax A NIGHT on a two night minimum stay. Single nights at a slightly higher rate, depending on availability. RESERVATIONS or need more details? You might also want to check CliffSide availability on-line at our other facility, INn by the Mill. After checking availability, use your back button to return to this page, otherwise you will be within the other website. To read PDF files download Free Adobe Reader. Need to make a reservation, check availability or need more info.? CliffSide is located close to many fine restaurants.